Perfect for small runs of vegetables. 20 to 40 lbs per load. Great for leafy greens. 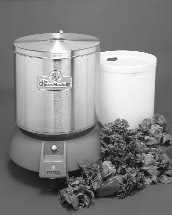 Stainless steel body and lid. Includes a 20 gallon white basket. Extra baskets available.